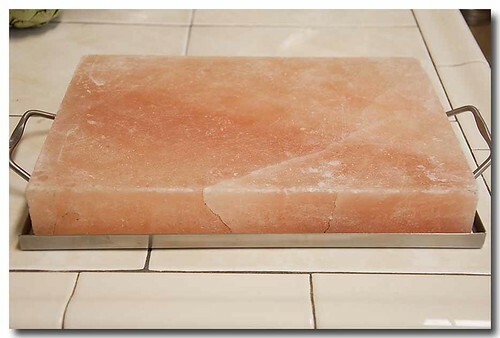 I finally bought a Himalayan Salt Plate. Let's heat that baby up and get cooking. I bought it at Sur la Table for $29.95. It's a pretty good size, it's 8" x 12" x 1½"
Before going to SlT Squeaks and I were at the Orange County swap meet. 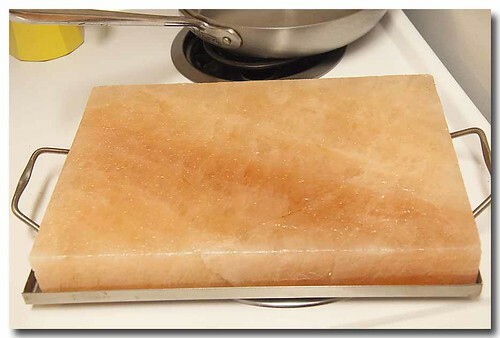 We happened upon a vender that was selling the same exact salt plate for $60.00, he wasn't very happy when I told him SlT had the same exact one for half the price. He started his pitch by questioning the size of the plate SlT had and was telling me there are only two importers of the salt plates in the U.S. and he knows both of them blah, blah, blah. After a little discussion and my not backing down on my statement, he then began to backpedal saying how SlT with all it's locations can buy in much larger quantities, bigger discounts, blah, blah, blah. What-evuh, talk to the hand, I was already on my way to SlT. 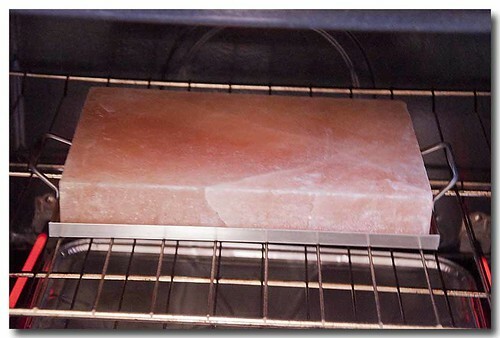 Place the plate into a cold oven. Bring the oven and the plate up to temperature at the same time. 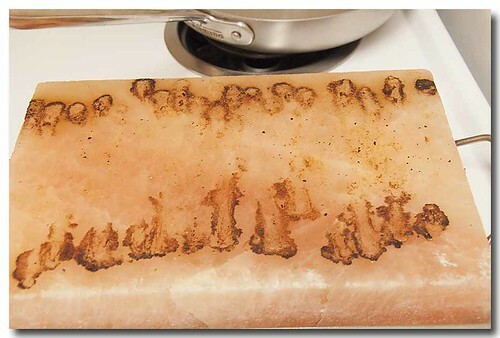 Do not put the plate into a hot oven. While the plate is heating up I tossed some asparagus with olive oil and freshly ground black pepper. 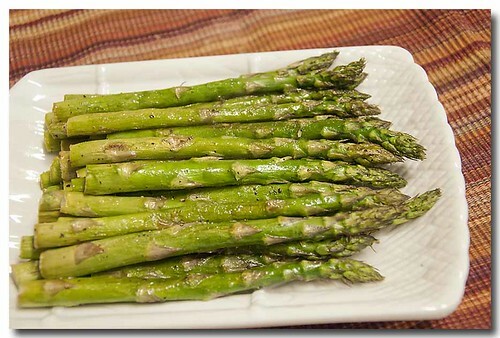 Once the oven reaches temperature, 400*F place the asparagus on the salt plate. When the bottom of the asparagus starts browning, turn them over to finish roasting. Tender, tasty, faintly salty spears of asparagus loveliness. I'm so happy the salt plate does not impart a lot of salt into the food. They were not as salty as they would have been had I roasted and seasoned them like I usually do. 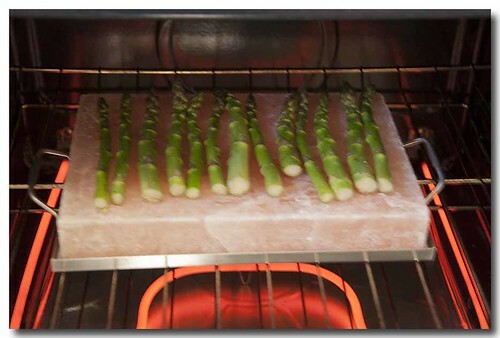 Once I removed the asparagus from the plate I put it back into the oven and let it cool down with the oven. It was still pretty warm later in the evening so I left it in the oven overnight to totally cool off. Using a fresh non-soapy dish cloth and warm running water, the salt plate cleaned up easy peasy. 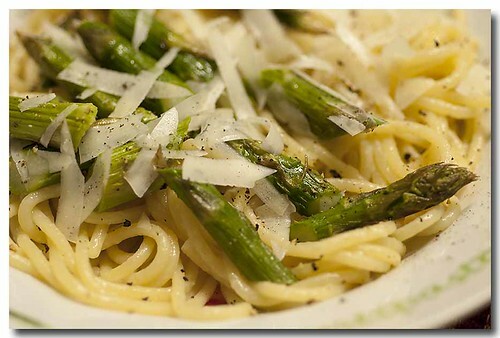 I made a quick dinner of spaghetti tossed with butter, Parmesan cheese and the asparagus.